Occitania is the name of the countries where the Occitan language is spoken, in France, Italy, and Spain. In all those countries but Spain, where the local variant of Occitan, the Aranese, is protected by law, the Occitan language is minorised. There is no compulsory teaching of the language, which is often taught by non-governmental organisations. In the past centuries, the inhabitants in the French part of Occitania were poised to emigrate to the northern France, in the Paris area and in other places. Occitany or Occitania, includes 32 départements of Southern France, the Aran valley in Catalonia, Piemont alpine valleys and the calabrian city of Guardia Piemontese in Italy. Occitania is the name given to the Occitan speaking area. That language was and still is known under many names: roman (in the Middle Ages), language of oc (used by Dante Alighieri), lenga mondina (from Raimond, name of the Counts of Tolosa/Toulouse). The names of its dialects are sometimes used to designate the whole language: provençal, gascon, limousin, auvergnat. The Occitan language is a language of the Romance family, descending from Latin. Due to its minorised situation it suffers from a huge dialectal fragmentation. Three big dialectal areas are widely defined: Northern Occitan (Limousin, Auvergnat, Vivaro-Alpine), Middle Occitan (Languedocian and Provençal), Gascon. Occitania originates from oc, meaning 'yes', in the so-called oc-language. Oc gave also its name to the province of Languedoc (litterally 'language of Oc'). Transition or interference areas exist between the Occitan and the neighbouring romance languages: with the French ; with the Gallo-italic dialects. Two Occitan speaking enclaves remain, Labastida-Clarença, in the Basque country and La Gàrdia (Guardia Piemontese), in Calabria (Southern Italy). Foreign-speaking enclaves exist in Occitania: Ligurian ones in Provence (Biòt, Vallauris); French one in Gascony (Petita Gavacharia de Montsegur). The first masterpieces of the european litterature come mainly from the Trobadors (troubadours). Knowing their language can help the reading of these texts and the penetration of their culture. Nowadays Occitan is spoken, above all in France, by speakers who are often ashamed of speaking their own language because of french educational system. If you know France you have certainly noticed that speakers from the South speak French with an "accent". This accent is caused by the Occitan substratum. If you come to them and show Occitan is not a contagious disease, it will help our language to recover its rights in its country. Moreover, because of its roots, Occitan can be an excellent bridge to those who want to learn Spanish, Catalan, Italian, French or Portuguese easily. Some claim (and justly!) that it is easier to shade one's thoughts in Occitan than in any other european language: Occitan has more than 160,000 words (French: about 40,000). Occitan's closest language is obviously Catalan. Lots of linguists even consider that Occitan and Catalan are the same language. 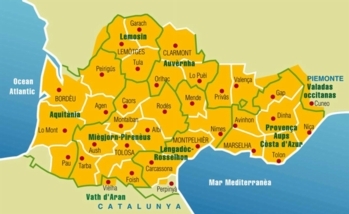 Occitan is closer to Catalan, Spanish, Portuguese and Italian than French. The Occitan flag is the Languedoc cross. It was the County of Toulouse emblem before the annexion by France (1271) and then became the Languedoc province emblem. It is said it was brought to Occitany by Raimond de Sant Gèli, the Raimond IV of Toulouse, back from a Crusade in the XIIth century. The twelve terminations represent the 12 months of the zodiacal wheel. A christian interpretation of the 12 apostles came later. The cross represents Occitania (Occitany). The charge is a 'cross cleché and pometty voided' - stylized key-handles. This flag is, in fact, the historic banner of arms of the counts of Toulouse. It can be said to represent Occitania only in that the counts were the most powerful nobles in the region. So this cross you'll see everywhere in Carcassonne and a large part of Languedoc is NOT a "cathar cross" (it never existed), but the Occitan cross. You want to get an idea of what the occitan language look like ?